Not all dreams end up the way you planned, unless they're controlled by Leonardo DiCaprio and the Third Rock from the Sun kid, and you planned on them being really confusing, and apparently about architecture. 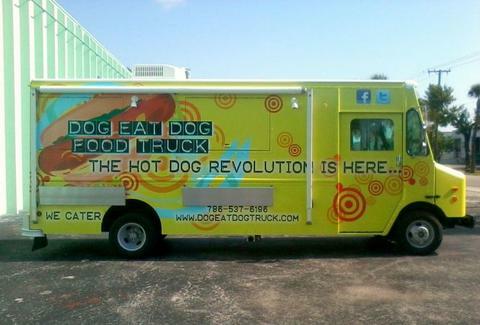 Downsizing their dreams to make you nice and fat, the guys behind Dog Eat Dog. Run by three non-native dudes (two from Venezuela, another from even-more-exotic Virginia) who came to Miami to open a restaurant -- only to scale down to four wheels after realizing there somehow wasn't already a truck serving eats that make for easy wiener jokes -- Dog's yellow-clad mobile is dishing out souped-up versions of the cookout staple, and plans to become a fixture at Thursday's Century Marketplace and Friday's Truckers Out West. First tell 'em if you want yours grilled or deep-fried, before diving into options like the Argentina-style sausage Choripan smothered in truck-made chimichurri, as well as a range of 100% kosher beef choices, from The 305 Dog (a bacon-wrapped frank covered in pineapple-poblano salsa and shoestring fries), to the spicy, ancho chili-pineapple sauce-, corn- & cole slaw-coated Latin Dog, also what Randy Jackson says if you ask him his favorite dead language. You can wrap any of the dogs in bacon or add extras like corn or caramelized onions, plus there're sides like sweet potato chips with marshmallow sauce and desserts like the Nutella- and 'mallow-covered caramelized banana "After Dog", also what Randy Jackson says if you ask him which party is after the party. On the drinks front it's currently just sodas, but the gents have hopes of serving beer in the future, although nobody's quite sure when that'll be, as it takes a really long time for vans to drop into a river and your head to snap forward these days.